So You Want a NonTraditional Themed Birthday Party? Even before his birthday, all my 2 year old wanted was the movie “Rio.” If you don’t know what Rio is – you’re not alone. Rio is a sweet movie about two parrots in Rio de Janeiro, Brazil. The film includes a nice social element about conservation. In any event, the movie was the first thing he asked for in the morning and the last thing before he went to bed. My dad even made up a song – “rio in the morning, rio in the evening, rio in the afternoon.” So, I took it as no surprise that CJ wanted a Rio birthday party. Rio is not one of those pre-packaged parties you can find at Target, Walmart or even my favorite locale for party supplies, the Dollar Store. Perhaps during the summer you could use luau themed supplies, but in the dead of winter they are hard to come by. Trust me – I tried. From invites to food it became a fun challenge and took my own party planning to the next level. I started by sharing the challenge with a more experienced (and creative) friend of mine who makes her own invitations that look elegant, classy and professional. The trick – stamps, craft scissors and glitter. Who knew that this affordable trinity of goods could create a heavy weight card-stock invite that was personal and fun. Once the invites were done, it was time to consider menu & decorations. Elements of the movie came to mind parrots, Carnival, tropical fruit. It evolved into a quasi- Mardi Gras theme with necklaces,masks and maracas for favors, punches for beverages, and brightly colored tissue paper flowers for decorations. Punches are my favorite party beverage. They’re easy to make and delicious. I usually do two an adult beverage like bloody marys and a virgin beverage. This time, Sangria popped into mind – so that was that. The concoction – plain red wine, some white rum, a bit of gran marnier, a little sugar, orange soda and club soda. 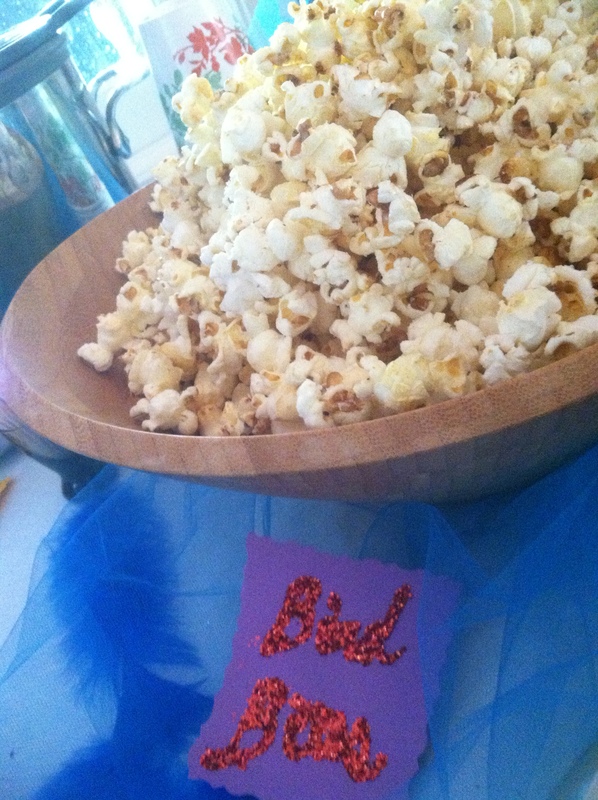 Feathers, glittery pompoms, colored lights and tulle decorated the house. 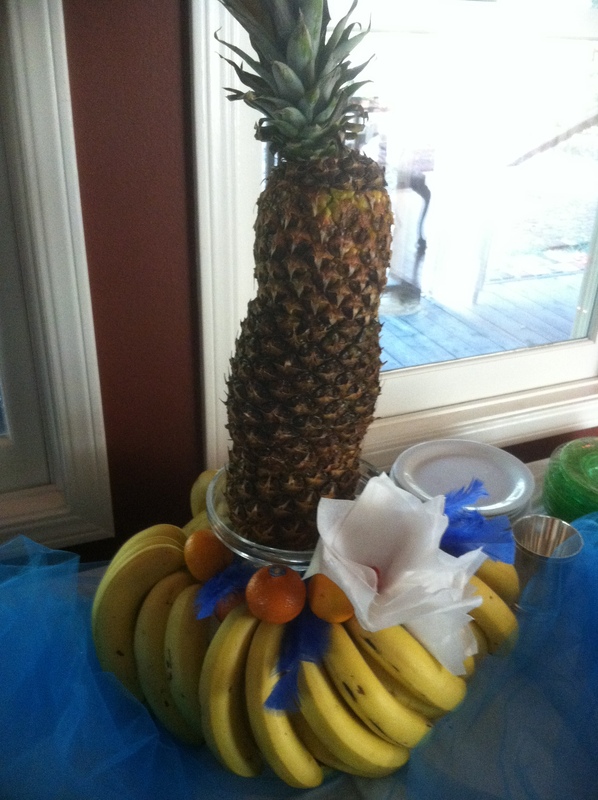 The table centerpiece was a pile of bananas topped with a tropical tree made with pineapples. 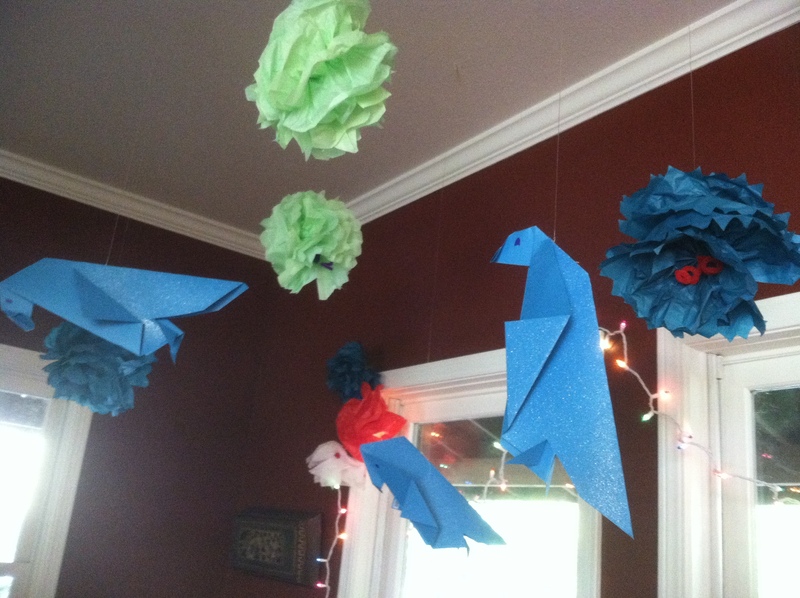 Tissue paper pom poms and origami parrots were dancing up above. (Tha nk you Martha Stewart for the recipe for fabulous pom-poms, and Tiny Shiny for a template for origami parrots that was easy to follow.) 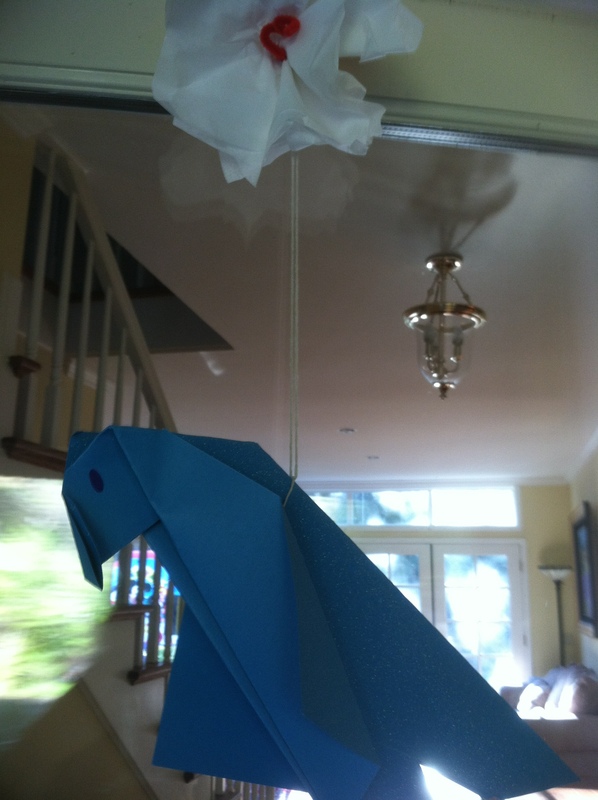 Tried making an origami parrot? Well most of the directions call for tons of steps that made me feel like a total idiot! I was immensely grateful to find Tiny Shiny’s post offering a 6 step parrot. For food, I decided to do bird bites. Since the party was mid-afternoon, the idea was to provide a mostly well rounded menu that could serve as dinner if folks desired. Meatballs, Pineapple, Cheese Balls (recipe here), Pesto Pizza Bites, Soft Pretzels; and since a party isn’t a party without sugar (don’t tell they boys’ fabulous dentist Cherylin (JK)) – homemade fudge & kettle corn. Lastly, for entertainment, we broke the bank putting $$ from my Ebay store (WinePlusCountryEqualsStyle) and rented a jumpy from a local Sonoma company. I’m usually anti-jumpy, due to cost, but having done parties both ways the jumpy is worth the dough. Russell at Jump Jump gets an A+ in my book for being easy to work with, providing excellent service and a practically new jumpy. At the end of the day, throwing a nontraditional birthday party is a winner in my book. Thinking of how to go with the theme, or no theme, and putting your own stamp on it is such a fun experience. For anyone reading this, I totally recommend it. For me, well, it’s time for a sugar detox. And time to plan the next shin-dig a MadMen themed cocktail party to raise awareness about the Epilepsy Foundation – whaahoo! 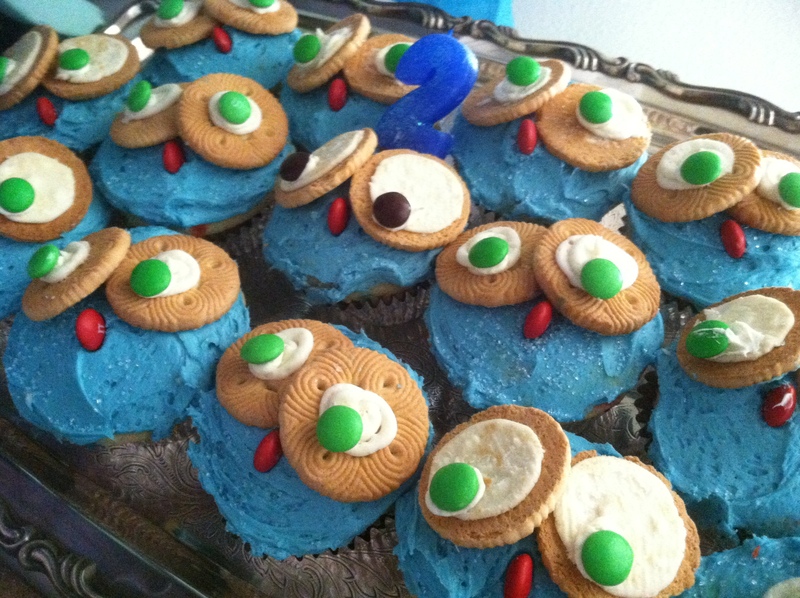 This entry was posted in celebrations, eagle mom, recipe, Uncategorized and tagged recipe on January 13, 2014 by Modern Mama. 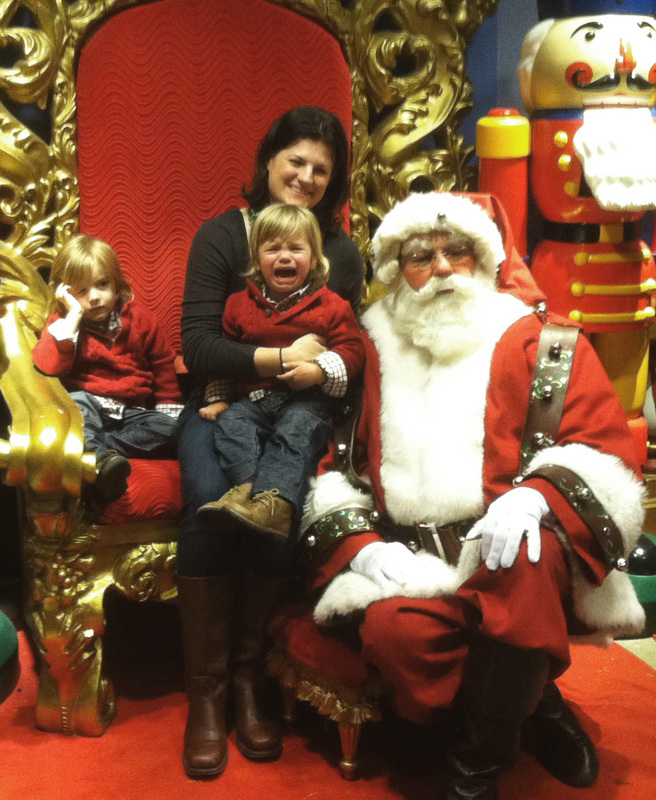 This entry was posted in adventures and tagged Christmas, Christmas carol, Deck the Halls, Holidays, Lyrics, Music, San Francisco, Santa Claus on December 16, 2013 by Modern Mama. It was one of those mornings. You know the type, where the boys were up way before the sun. So, after pulling out all the tricks in the box by 9, it was time for some sort of project to keep those little hands busy and minds occupied. Looking at the box of broken crayons, an idea came to me. Eureka, I found it! Why not let them play with crayons in a way they hadn’t before. So, like casting out bait to catch a fish, I asked them if they wanted to make crayons. C grunted and B while bouncing up and down, shouted yes. The bait worked. I let them start to try to peel the wrappers off of them. This task caused more frustration than fun, so I started thinking of other ways to do it. I thought about soaking them. A blog post by TimeForPlay assured me that it would work. 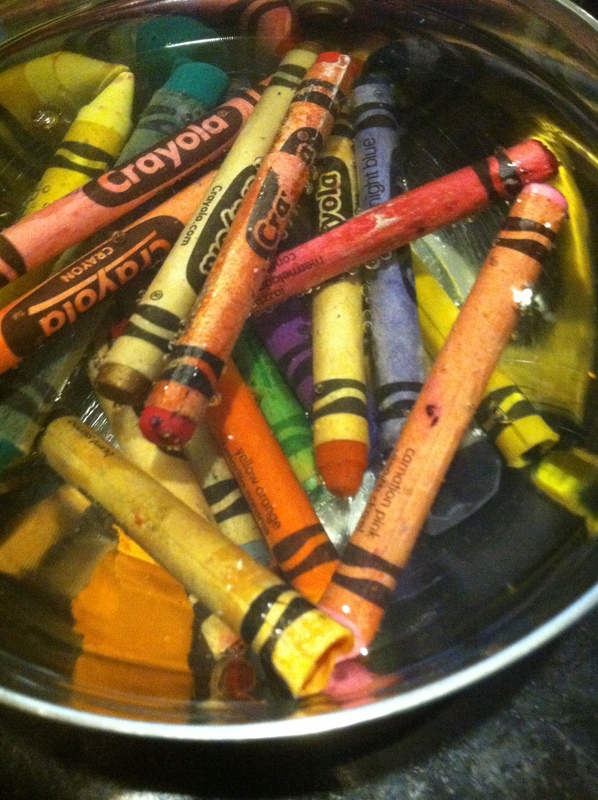 After a few minutes of soaking fun – the wrappers magically came off of the crayons. So, it was onto the next step. Taking them out of the water. Both C & B loved this bit of sensory fun. You should have seen their faces when they discovered that little bits of crayon had decorated their hands. Pure amusement! It was like Crayon magic. Then, B lined a mini-muffin tin. Thank you OurBestBites for the idea. 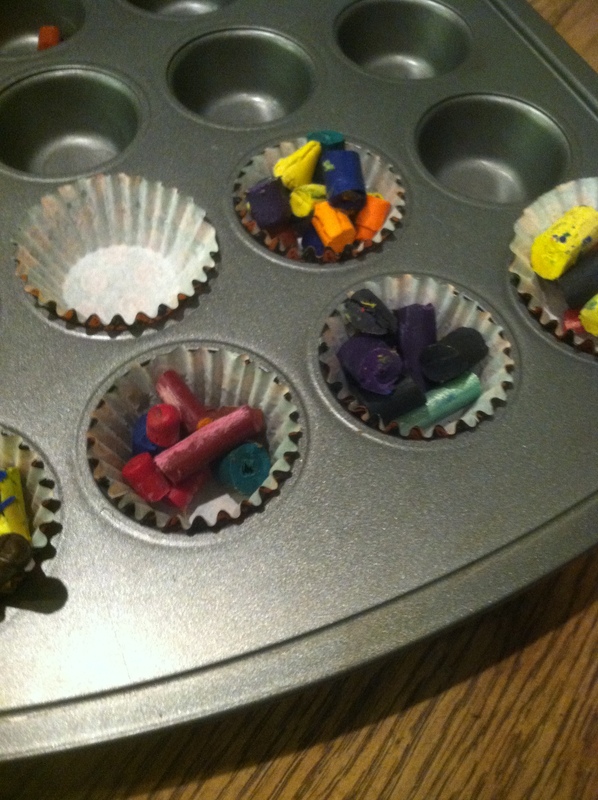 The boys placed the crayons in the muffin-tins. And, we were well on our way. 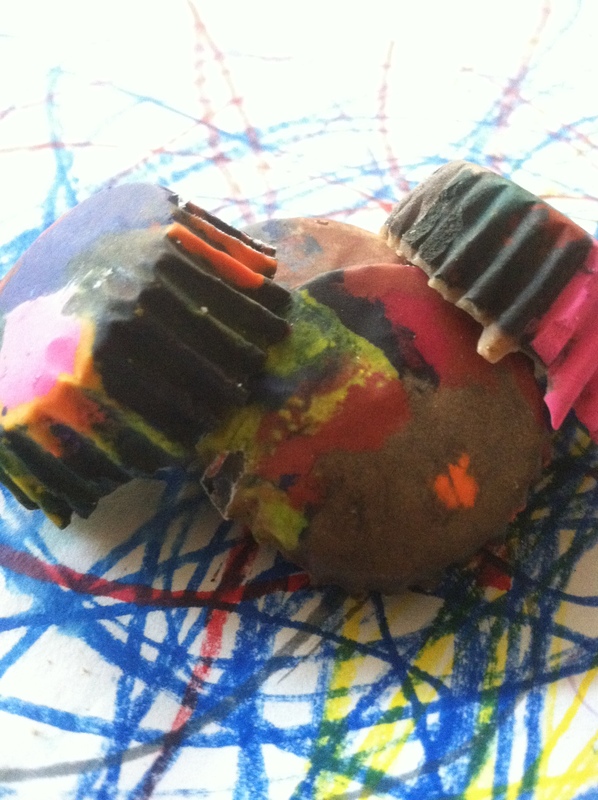 After sitting in an oven warmed to 200 degrees, the crayon bits melted. They cooled. 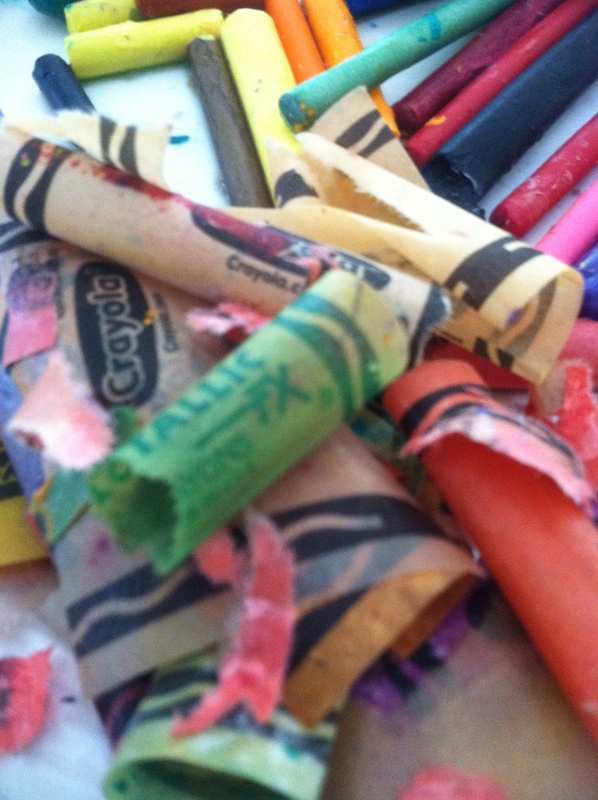 Such neat little —–crayon masterpieces! Now, these artistic are B&Cs favorites for making masterpieces of their own. 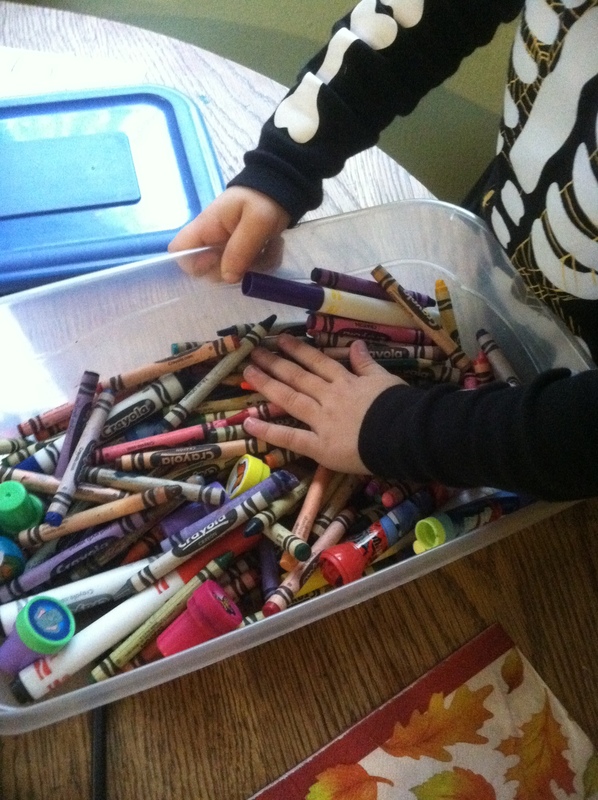 This entry was posted in activities, sensory activities and tagged Art, Business, Color, Crayola, Crayon, Shopping on December 15, 2013 by Modern Mama. This entry was posted in eagle mom, musings on November 11, 2013 by Modern Mama. Need a morning activity for the tot(s)? Well, this has been the biggest hit yet. Just grab a handful of spice jars and let your little one have fun taking the tops on and off. You can even use full jars with spices and let them use their sense of smell to match the lids. Both of my boys can’t seem to get enough of these jars. They try it individually, and then even do it together. It’s so telling to watch B teach CJ how to do it. His patience and sweet nature just shine through. In addition to learning the Montessori termed practical life skills and developing sensory skills, he’s learning to gently use his communication skills to help out his younger bro. 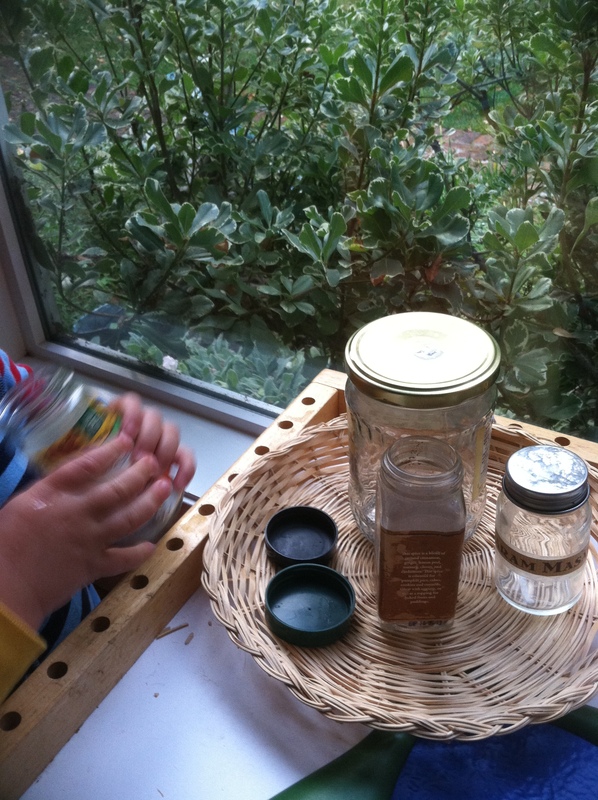 This entry was posted in activities, montessori, sensory activities and tagged Food, montessori, Shopping on November 7, 2013 by Modern Mama. Any of you who’ve been keeping up with my blog lately know that my current strategy for keeping my boys engaged and busy is more of the Montessori genre. Why? Well, because it has proven to do wonders for my oldest son B. 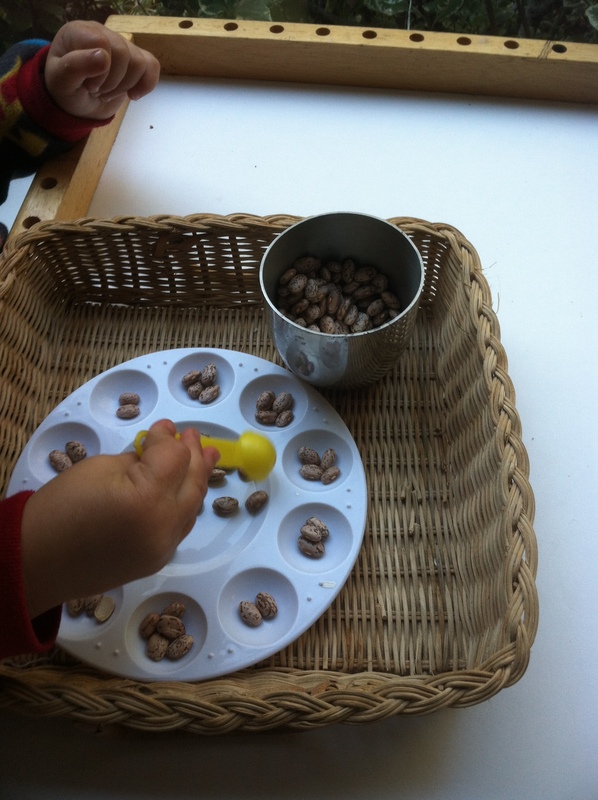 For those of you who are new to the Montessori style, there are different categories of activities. Sensory, practical life, language, math and culture. This week B & C are enjoying beefing up on their practical life skills. Preparing for these activities just took a little bit of time and thought. 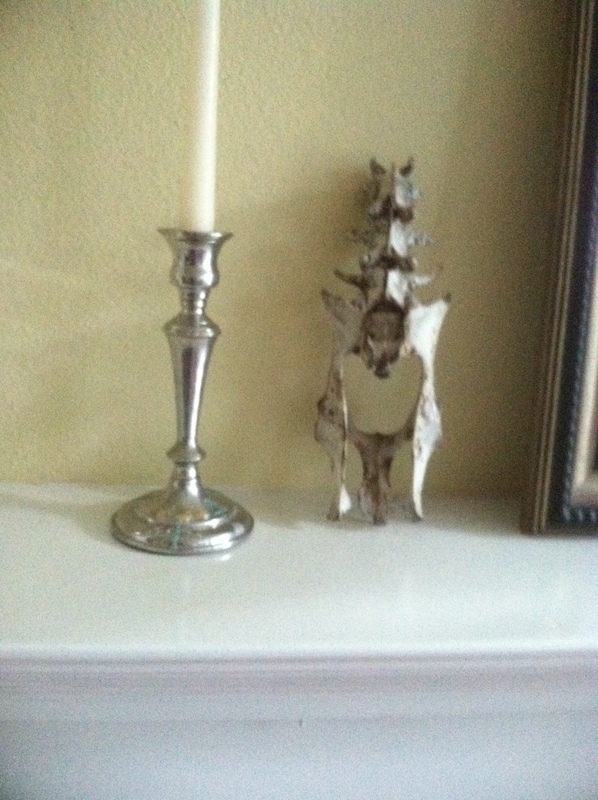 I carefully selected a few things and set them out on little trays on the living room shelves. Funneling rice, tweezing buttons, scooping beans and twisting the lids off of jars are the weekly activities. B was thrilled when he saw the new trays on the shelves. He went to them right away. Deciding to first conquer the funnel, B mindfully brought the tray to the table. C followed in suit but picked the beans. I suspect he may have been attracted to the beans, because they included a yellow spoon. And, he’s really into yellow right now. So, if there’s something else I want him to try, I might just try to incorporate yellow. After working on their practical skills and fine motor development, we went on to more gross motor fun. Building forts and castles, and falling onto pillows. Clearly we don’t do Montessori activities all day long. They are just the activities prominently offered in the living room. In all honesty, the boys will focus on these activities for about an hour at a time. Then, we go on to more imaginative types of play and more Waldorf style outdoor play. Thanks for reading. Check back for more fun activities to do with your tots. 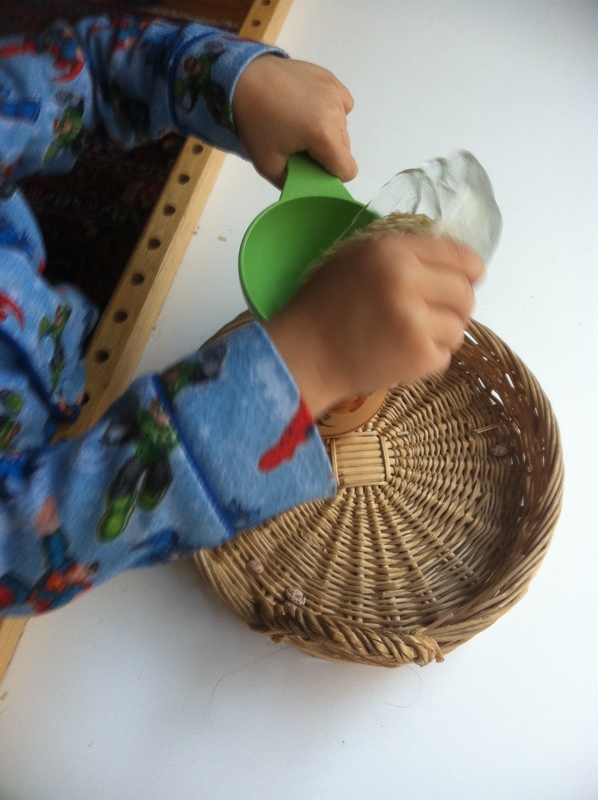 This entry was posted in activities, eagle mom, montessori, Waldorf and tagged Education, Learning Theories, Life skills, Methods and Theories, montessori, Montessori education on November 6, 2013 by Modern Mama.